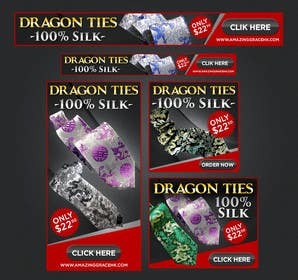 Product: Neckties as seen in main category Accessories, sub-category Dragon Ties, www.amazinggracehk.com. Original close-up images will be provided if needed. Attached 300x250 mock-up by client shows actual products to be included, all or some. Hi Sir please check the entry number # 33 I've made the link to check with the manufacturer changes since I can not upload another entry for the contest is over, thanks .. Still not working, please don't use dots in the name of the picture. Is this animated banner or static banner? you put another. after jpg. Re upload it without the .after jpg and itll work. Sorry, have uploaded image again.